Sutton Coldfield Town fans may not be the most numerous in the land but they can’t half make some noise. 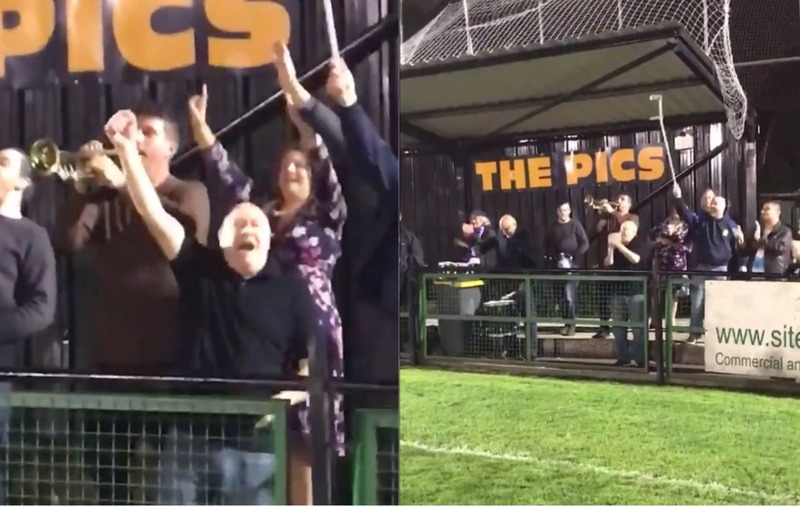 A group of the non-league club’s most dedicated fans formed a band in the stands, whose talent, pluck and phenomenal mashup of La Cucaracha and The Champs’ 1958 classic Tequila has gone viral. “When we first brought out Tequila everyone on the bench including the manager started singing along,” Chris, the band’s trumpeter and founder, told the Press Association. The newfound fame of the SCTFC Ultras group all began five years ago, when Chris and a group of friends travelled to Central Ground, Sutton Coldfield, to watch The Royals in action. “We fell in love with it straight away and we kept coming back,” Chris said. “The only thing was it was very quiet and very few fans. “I asked the club after a few games if they wouldn’t mind us bringing a drum. We put ourselves behind the goal and gradually started attracting a number of fans to join us. Sutton Coldfield Town currently play in the Southern League Division One Central, the eighth tier of English football, having been relegated from the Northern Premier League Premier Division last season. Home match attendances at the club usually number around a hundred or so fans. “Having this group of supporters following us is a major bonus for the club,” said Sutton Coldfield Town’s general secretary Neil Murrall. “We don’t enjoy big gates for our games so the fact that a small group makes lots of noise is great for us, for our team and for the atmosphere for everyone. The band’s core is made up of Chris, Dave – also affectionately known as Shrek – on the snare drum and Josh, Alex, Callum and another Chris, who all take turns on the drums. “We don’t take ourselves seriously,” said Chris. “We don’t throw insults at opposition fans even when we frequently get it thrown at us … we are there purely to cheer on our team. “Small non-league matches have been criticised for having no atmosphere like you get at league matches. Chris said other song favourites that they play include Ring Of Fire and The Great Escape. “We’ve got some other good ones in the pipeline but you’ll have to wait and see,” Chris added.